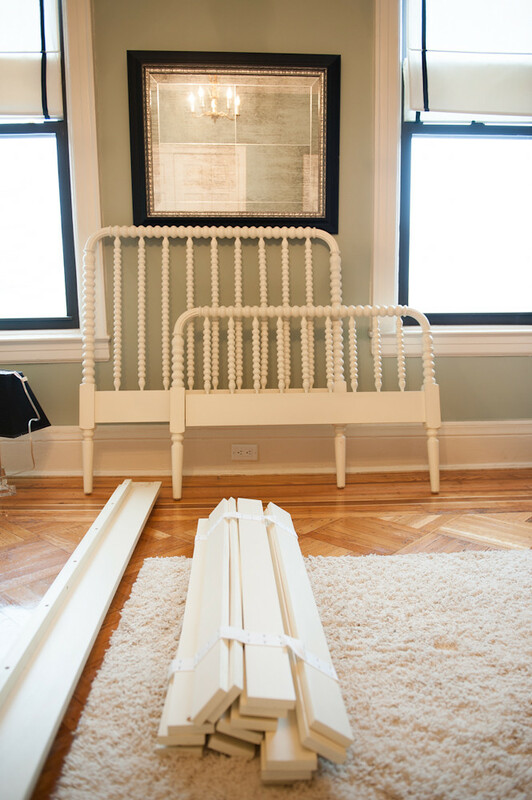 Guess who is the proud owner of one pre-owned Jenny Lind twin bed? After a year of stalking Craigslist I had just about given up and was seriously considering buying new. Then several of you alerted me to a listing on a local parenting board of this one. We made a deal and now it's mine. THANK YOU SO MUCH! You have no idea how excited I am. I had to quickly make room in here so I gave the full bed to my brother so I had some room to move around. (If you are interested in that black framed mirror and you are local, drop me a line. I'd be happy for it to find a new home). The artwork and card catalog will have to be relocated somewhere else around here because I love them both but they don't work with what I have in mind for this room. I plan on waiting until I paint the room to decide if I'll leave the bed white or paint it a fun color. I'm currently going back and forth on the idea of painting the whole room black or the whole room a bright white. Decisions, decisions! I also have to get a mattress. I'm thinking of this foam one - very well reviewed but surprisingly cheap from Amazon. Anyone have this or something like it and have a review? Obviously there is a lot more to come in here. I'm so glad you found one! Is it originally from Land of Nod? Doesn't look antique (which honestly is great so you don't have to do anything to it!). Nice find! Yes its the same one. I will probably paint it but that isn't a big deal. Well worth saving the $! We have two Jenny Lind Cribs (not hard to get, I know) and painted them turquoise. Love them!! I love the cribs too. I wanted something a little more modern for the nursery but if I had went another way, I'd be all over those. That looks awesome!! What a lucky find. I would definitely go with bright white because I think that it would be better for little Aggie. Don't get be wrong, I love a black room as much as the next person! Man, I wish that I was local (tiny bit far in D.C.), but my brother is moving back their in a couple of months, so if no one else takes it off of your hands by then I would be more than willing! You know me - I tend to go a little more nontraditional when it comes to kids rooms. I do like the idea of all white but I'm not sure how much I will love having the molding the same color family as the walls (and I'm not a big fan of dark molding) I do like it how the cream on white looks in my dining room but its not bright enough for what I'm thinking in here. Have you thought about painting the ceiling a different color? Not a super novel idea, I know, but just wondering! Thanks. Which one did you get? Our front parlor is black and I love it. It's always mysterious and moody, yet elegant. We are using the room like a library and wanted something cozy. 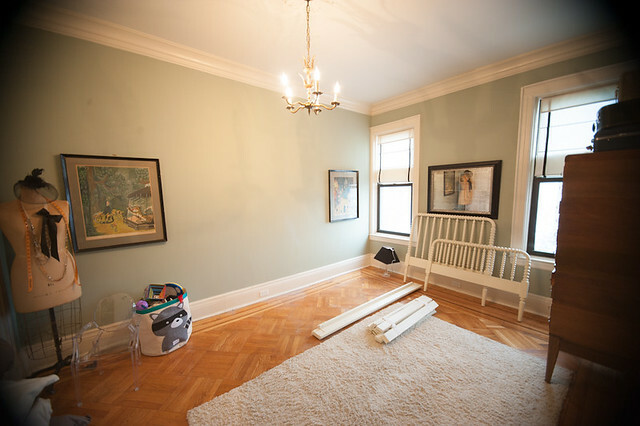 As for a toddler room, I'm not sure I would do it unless there won't be a lot of wall space available. Thanks Laura. That link was for a regular spring mattress. Did you get a foam one? Thanks for the heads up Tamara. Which brand did you buy? Congrats on the new purchase. I guess I need to start now searching for a Jenny Lind. Can't wait to see what you do! We bought that mattress on Amazon and our son loves it. I've taken quite a few naps on it as well and I must say it is amazing that that thing came out of a duffle bag!